In Alyson Hagy’s latest novel Scribe, she combines some of the myths and legends that shroud Appalachia in mystery with a plot line of her own, creating a world both familiar but uncomfortably different to what is real. Hagy’s future Appalachia clings to tradition and superstition in the wake of a civil war and the spread of a fatal disease. The world in the story is on the verge of chaos, awaiting the slightest touch to send it hurtling over the edge. One element threatening the unstable peace in the novel is the stories that are spread across the area. The novel explores the effects that stories, whether true or fabricated, have on both individuals and society as a whole. These stories are the driving force of the novel, influencing the various characters and their decisions. Late in the novel, one of the characters says, “I can’t be changed much by what’s on a piece of paper- whether I’m young or old.” Hagy questions this idea, and throughout the novel, investigates how stories impact the characters’ lives. The novel’s protagonist is a scribe for whom words and stories are both a lifeline and a curse. 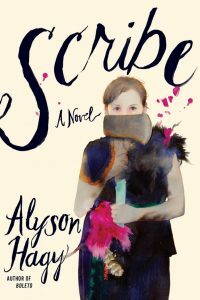 Scribe’s main character is a woman living alone in her family’s farmhouse who stays afloat “by bartering the only gift she had, the ability to write letters on behalf of the guilty and possessed.” She struggles to maintain a stable relationship with her neighbors, the alarmingly charming Billy Kingsley and the Uninvited, a camp of wanderers who loved her deceased sister but only tolerate her. When a stranger comes to have a letter written, the nameless protagonist’s world begins its descent into chaos. Hagy’s novel follows this woman as she attempts to navigate the tumultuous world that she is living in and cope with a past that she cannot seem to shake. Readers follow her journey as she must try to adapt in order to survive in her quickly changing environment. Both the plot and language in Hagy’s Scribe create a haunting environment for readers, making the novel impossible to forget even when its pages have been closed. The novel’s setting contributes to the tone; Hagy’s version of Appalachia is both beautiful and troubling. Hagy blends reality with dreams, magic, and mystery until it is nearly impossible to determine what is true and what is not. Hagy’s novel creates a sense of doubt and distrust that leaves its readers confused and fascinated at the same time. When one mystery is explained, two more emerge in its place. The distinct voice in the novel adds to the unnerving experience that Scribe creates. In one of her letters, Hagy’s main character writes “Please forgive the nights I wouldn’t let you sleep how I frightened you with stories.” Scribe is a crossroads of stories that intersect into a perfect disaster for its characters. Throughout the novel, Scribe’s characters attempt to manage and even stifle the pasts that haunt their present. Each character has a troubling past that hinders their ability to move on in their lives. The protagonist tries to ignore her own guilt by writing down the sins of others, but even that has its problems. Hagy writes “it wasn’t safe or simple to take on the burdens of another person’s history, all those sins and vacancies. The burdens sometimes stayed with her even after they were lifted from those who had earned them.” Eventually the weight of all the sins from herself and others takes its toll on the woman, forcing her to face her vulnerability in a way she has not before. The novel questions whether it is ever really possible for someone to leave their past behind them and start over. Hagy’s protagonist embodies this question as she attempts to overcome her distrust and skepticism in order to form relationships and continue on with her life. The novel puts this question to the extreme as conquering the past becomes necessary for survival as the story progresses. Scribe takes some of society’s most difficult questions and places them in the backdrop of a life or death situation. Can human beings ever truly change, or are they destined to remain the same, no matter how hard they try to improve themselves? Do stories really affect peoples’ lives? Are the tales and traditions passed down through generations a blessing or a curse? Where is the line between fact and fiction, and how can one find it? These questions guide the novel, leading it through a series of events where the answers determine the fate of Hagy’s characters. The novel examines some of the core questions about human nature through the actions of its struggling characters. The novel blends reality, folktales, mystery, and dreams into a mixture that effectively challenges the reader’s views of stories and the role they play in society.